Open the doors and the windows, let the summer breeze in and carry all the songs, music and dance from the Institut français. 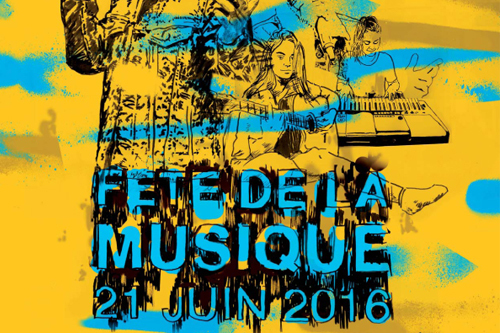 Et oui, c’est la fête de la musique and we are in a festive mood! Come along and enjoy an amazing line-up of bands, including Djana Gabrielle, Fuzzystar, Jack and the’ and The New Beans, who will perform throughout this first day of Summer. On this occasion, we are very happy to announce that the bistrot will be open with our friends from Pâtisserie Maxime behind the bar! 4:00 - 5:00 pm: harp workshop for kids Come and treat yourself and your children to a musical goûter. Meet Emeline and her family of harps of all shapes and sizes. She’ll tell you a bit about them and their history, play a few tunes while you enjoy your cake and she’ll even let you tickle them if you feel like it! For kids 6 and up. Places are limited so please book your place in advance. Influenced by Lou Reed and Bob Dylan, singer-songwriter Adrian combines his passion for French poetry with his love of folk music. Djana Gabrielle is a French-Cameroonian singer songwriter. After living four years in Paris where she played many gigs, Djana decided to move to Glasgow to experience its vibrant music scene. She released her debut EP ‘That very first day’ in December 2015. 7:15 – 8:00 pm: Fuzzystar (Lo-Fi, Indie – solo acoustic) Fuzzystar is the moniker of Edinburgh based Andy Thomson, performing off-kilter indie pop full of narrative, melodies and flashes of lo-fi fuzz. Two singles are pencilled in for Summer 2016, with full album release and UK tour in the Autumn. Formed in 2010 in Buenos Aires, The New Beans gained popularity throughout the years and the world with their songs being played on international radio stations (USA, UK, Sweden, France…). They currently live in Edinburgh and plan to tour and record their second album. Jack and The’ is a chamber pop band from Edinburgh led by a Frenchman in exile Julien Longchamp. They performed as a five-piece in the UK, France and Ireland and set up their own series of gigs in Edinburgh and Glasgow named Pop Exchange. They released their second album ‘Melody Cycle’ in February 2016. PLEASE NOTE THAT THE THEATRE WILL BE A STANDING-ONLY ZONE. Admission is free but please reserve your tickets in advance at the box office. Join the Facebook event and invite your friends!